A disk I/O bottleneck, resource contention, misconfigurations and other problems will degrade the performance of virtual machines. When too many VMs are competing for limited resources, results will inevitably suffer. This chapter looks at tactics that can help to combat these types of bottlenecks, particularly those stemming from the storage components of a virtualized environment. 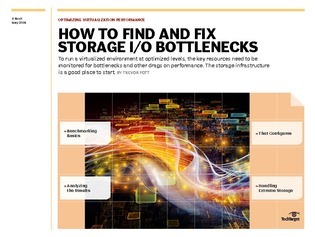 The effort it takes to solve storage I/O bottlenecks is considerable. Variables range from physical infrastructure choices to configuration changes. The starting point for solving your I/O problems will be VM monitoring and establishing baseline performance. From there, you can scrutinize read IOPS vs. write IOPS, network cards, and other specific points that are likely contributing to the I/O bottlenecks. With the right approach, a willingness to become a virtual machine monitor and the use of proper technologies, admins can solve the problems causing an infrastructure’s performance to suffer.